I put a way point just south of the breakwater of the marina. You will see the breakwater ahead of you. Move into the back of the breakwater seeing it on your left, you will see two sail boats mooring at the back of the breakwater, the club house and a crane. There is a small pontoon in front of them. As the pontoon has not enough space to moor alongside, you moor the boat bow-to. The marina keeps their motor boats on the hard. The pontoon is being used for tentative moorings when the boats are hoisted up and down by crane. 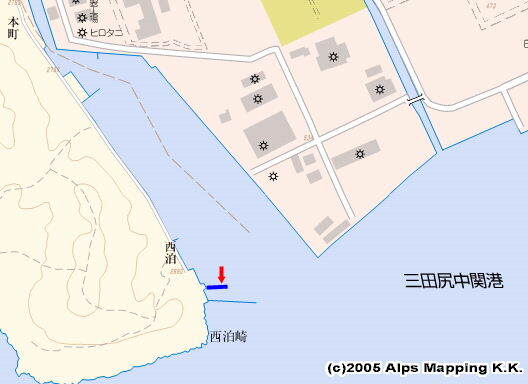 Then, this place does not look good for mooring sailing boats. The boat is weltering hard here. A water hose is extended to the pontoon though, it is too long to drink. There is no restaurant, no shop, no public bath, nor coin laundry near the marina. The toilet in the clubhouse is closed at night. Fuel is available at the marina.